Sodium laureth sulfate (SLS) or sodium lauryl ether sulfate (SLES) is a toxic chemical that is used in many applications. The most common use for sodium laureth sulfate is a detergent and a surfactant. Sodium laureth sulfate is mainly used as a foaming agent. The toxic chemical is found in many cosmetic and personal care products. Products such as shampoo, sprays, soaps, scrubs, toothpastes and other like products. Sodium laureth sulfate is also used in garage floor cleaners, engine degreasers, and heavy-duty soaps in the cleaning industry. Depending on the chemical’s source, concentrations can vary making the chemical more dangerous or less dangerous. Sodium laureth sulfate is an irritant and is known to cause eye or skin irritation. Sodium laureth sulfate should be stored in a well-ventilated, completely sealed chemical storage container. Depending on geographical storage placement, heating or cooling systems might be necessary. NFPA 704 classifications of sodium laureth sulfate can be found below. The EPA monitors the concentrations of other chemicals, such as carcinogens, that may be found in sodium laureth sulfate. Sodium laureth sulfate storage containers by US Chemical Storage. Sodium laureth sulfate storage should be contained in a tightly sealed, well-ventilated chemical storage container. Proper personal equipment must be worn before handling the toxic chemical. CHEMloc storage containers by US Chemical Storage offer a safe, and secure storage solution for toxic chemicals. When storing large quantities or small quantities, whether it be in drums, totes or smaller containers, the CHEMloc storage container is ideal. 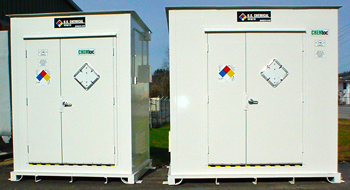 Designed for storing flammable chemicals 30 feet or farther away from your facility. The CHEMloc storage container is fully customizable to meet any specific requirement. Custom design your chemical storage container with a wide variety of accessories including alarms, racks, heating systems, mechanical ventilation, cooling systems, passive ventilation, sensors, flooring options, roll-up doors and more. US Chemical Storage CHEMloc storage containers are perfect for keeping your sodium laureth sulfate storage compliant. Meets EPA, OSHA, NFPA and FM approvals or Warnock Hersey standards. Get compliant today with US Chemical Storage. Call one of our experienced sales engineers or request a free quote online.